POLA's green bonds are part of a $201.6 million bond issue. Bond issue will net POLA savings of $32.5 million. The three top credit rating agencies all reaffirmed POLA's top investment rankings. The port of Los Angeles has issued $35.2 million in green bonds as part of a larger debt refinancing successfully completed earlier this month. The move marks the first time a U.S. port has entered the growing sustainability bond market where investors support projects and companies making positive social and environmental change. The green bonds are part of an overall $201.6 million bond issue that will net the port a record present value savings of $32.5 million, an average of $1.9 million annually through 2040. 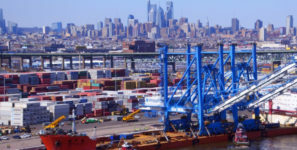 During the process, all three top credit rating agencies, Standard & Poor’s, Moody’s Investor Services, and Fitch Ratings, reaffirmed the port’s AA and Aa2 investment rankings, the highest ratings given to a port without taxing authority. The port’s top credit ratings reflect its strong market position, resilient revenue stream, strong financial management, superior infrastructure, cash reserves and manageable debt. The Cabrillo Shallow Water Habitat—a 190-acre feeding area for fish and marine birds.